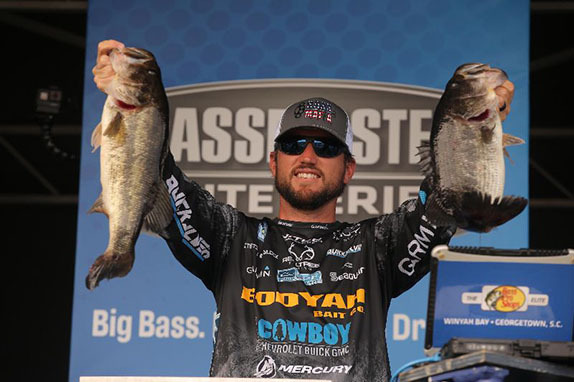 Stetson Blaylock moved up five places in the standings with his 17-15 stringer. Stetson Blaylock had a mediocre start to the 2018 Bassmaster Elite Series season with his 52nd-place finish at the St. Johns River. Since then, he's been on fire. The still-young veteran from Arkansas, coming off a runner-up finish last week at Lake Hartwell, caught a tournament-best 17-15 stringer on day 3 at Winyah Bay to jump from 6th to 1st with a 41-12 total. All of the new top 5 made at least a five-place jump as the field was whittled to 10 competitors for the final day. Cory Johnston leap-frogged from 7th to 2nd with a 17-06 haul that gave him a 40-04 aggregate. Clent Davis, the 2018 FLW Cup champion, went from 11th to 3rd with 38-06 (16-06 on day 3). Koby Kreiger bounced from 14th to 4th with 36-10 (15-04) and John Crews, one of the final anglers to weigh in, climbed from 19th to 5th with 36-05 (15-09). The other anglers who'll compete on the final day are Luke Palmer (35-13), day-1 leader Jason Williamson (35-03), Scott Canterbury (34-04), Jess Tacoronte (33-14) and standout rookie Patrick Walters (33-12). Canterbury gained 18 positions with a 15-04 sack. Day-2 leader Bill Lowen managed just four fish for 5-03 and plummeted to 12th. Lee Livesay, Hunter Shryock, Bill Weidler and Clifford Pirch also dropped out of the top 10. After a sunny and relatively calm day 3 during which quite a few big sight-fish were corraled on low tide, the weather is set to change dramatically for the final day. The sun could be completely nonexistent and the wind is forecast to blow at nearly 20 mph from the south. A 5 1/2-pound bed-fish that Blaylock spotted and caught toward the end of the day was responsible for pushing him to the top of the standings. It replaced a 1 1/2-pounder his livewell. "On top of already having a good limit, that was the icing on the cake," he said. "I got it to bite pretty easy and it was exactly what I needed to go from a good bag to a great bag." He's primarily fished just one small, hard-bottomed spot in the Waccamaw River with a couple of different YUM plastics all three days. He thinks there are more bedding fish around, but he's unable to see them when the tide is high. "Three guys who made the top 10 are fishing there some, but only two are there the entire day. It'd be nice to have it to myself, but it's impossible because everybody finds the same stuff. I'm just trying to make the most of it. "It's definitely going to be a struggle to catch enough to win tomorrow and it has been every day. I just hope I can get one nice one here and one there and they'll get me to where I need to be." Hard-bottom spots were also the key for Johnson, who's making the long run to the Cooper River. "Today I did things a little differently � it was the same sort of area, but I could see a little bit better," he said. "I found three spots in the area that had the right bottom and they seem to be concentrating the bigger fish." He went through 20 keepers or more and his bag was headed up by a fish that weighed more than 5 pounds. He lost one that he didn't see, but he said it felt big. "My confidence is pretty high, but it'd be a lot higher if it was going to be sunny and calm tomorrow. I think I'd have a real good shot at it. It's going to be cloudy and windy, but I know where those areas are and I'll just have to do a lot more blind-casting." Davis, who's caught all of his fish on Mister Twister Buzz Bug attached to a Nichols swimjig, said he simply ran into some big bites on day 3. He's fishing the Waccamaw and Pee Dee rivers. "I'm all by myself except for one area where I guess Stetson has lived and died," he said. "I'll be moving around again tomorrow � I'm too impatient to sit in one spot. I'm just running around and fishing stuff that looks good and I like my chances, honestly. "The tide is definitely a deal, but the main thing is just being around them." His stringer was topped by a 5-11 that he caught early and a 4-pounder that bit in the afternoon. "I thought that biggest one was a mudfish when it bit," he said. Kreiger is also plying the Waccamaw and the Pee Dee. He throws V&M plastics around cypress trees and other woody cover until the tide gets right, then he goes sight-fishing. He looked at four of the fish he brought to the scale on day 3, including a 5-pounder that he caught around noon. "The last couple days, just being patient and waiting for the tide to change has been the big thing," he said. "It was pretty crowded in there the first two days, but every day there gets to be less and less people. I had some local help today, which is always fun. He was forced to weigh in a dead fish, which cost him a four-ounce penalty. "I didn't see anything the rest of the day that was bigger than that one, anyway." > Day 3 stats � 35 anglers, 28 limits, 3 fours, 1 three, 2 twos, 1 zero. The following anglers did not make the cut and will not fish on day 4.